With Inauguration Day behind us, Republicans at last can embrace a president who promotes the ideals of their party: Barack Obama. Though Republicans reviled, opposed and obstructed him for eight years, the 44th president supported and advanced many GOP goals, like reducing taxes, spending and the federal deficit. 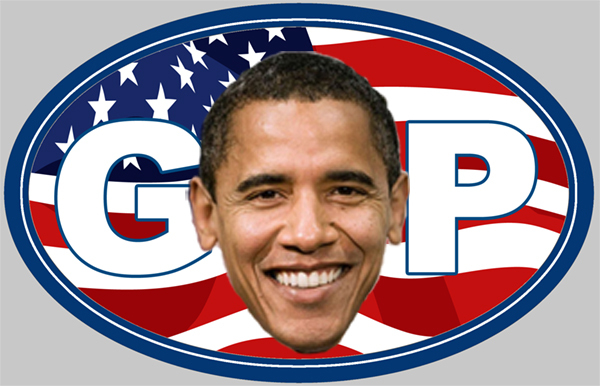 Contrary to common Republican beliefs, Obama made impressive progress on all three fronts. He lowered taxes on 95 percent of families and cut 18 different taxes on small businesses. The president’s American Recovery and Reinvestment Act reduced taxes by $288 billion and Obama extended all Bush-era tax cuts, some indefinitely. Obama signed the Budget Control Act of 2011 which cut government spending by $917 billion, followed by later budgets that reduced spending still further. Entering office with a whopping $1.4 trillion deficit, he lowered the annual shortfall by 69 percent by 2015. Obama oversaw a dramatic turnaround from the Great Recession that started in 2008. Between his first and last days in office, the SP 500 average increased by 270 percent, the NASDAQ composite improved 369 percent and unemployment dropped by 3.1 percent (from 7.8 to 4.7 percent). In each category, Obama outperformed Republican icon Ronald Reagan (who saw the SP 500 improve 218 percent, the NASDAQ increase by 197 percent and unemployment fall by 2.1 percent). Speaking of President Reagan, Obama followed in The Gipper’s footsteps on national security when he negotiated the New Strategic Arms Reduction Treaty with Russia in 2010. Reagan also set a precedent for dealing with Iran, supplying the quarrelsome nation weapons in exchange for hostages in a much-criticized and illegal deal. In contrast, Obama’s leadership ended Iran’s nuclear weapons program legally and peacefully. Obama signed no gun control laws while the number of guns in the country increased by tens of millions, now approaching 400 million and exceeding the national population. He did make executive orders to increase background checks before gun sales, an idea which polls show Republican majorities support (except when Obama promotes it). Republicans should appreciate that under Obama, the number of abortions performed annually dropped to a 40-year low in 2014. The number of deportations increased four years in a row, setting records and averaging 422,000 per year from 2012-2014. And the Paris Agreement requires 194 other nations to shoulder the vast majority of expense and sacrifice to address climate change. Even the Affordable Care Act was based upon a proposal by the Heritage Foundation, a Republican think tank; the Congressional Budget Office estimates that it will save the nation more than $1.3 trillion over 20 years if allowed to continue. Obviously Republicans had many complaints with Obama, but considering the record honestly, one could reasonably conclude that if Obama was part of the GOP, the party would even now be commissioning statues and naming schools after him. Now that this moderate Democrat has vacated the White House, Republicans should be a little more willing to recognize his achievements in support of their own goals. But they probably won’t.